Home › History › MORE Silver Laughter LIVE – Cover Songs! I heard this song on the radio today and thought I should re-post. We were a very good cover band as well as doing original material. 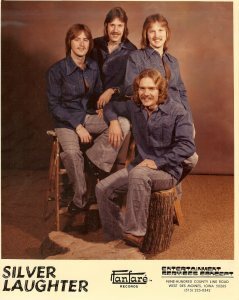 The “prison blues” were one of our matching outfits we were occasionally required to wear by club owners. The cut was from our Port Byron performance in June of 1978. The lineup for this song was Jon on guitar, Ken on bass, Paul on drums and me on piano. You can hear Ken double-tracking my vocal an octave lower on the “Evil Woman” chorus. Here is another song where I switched from bass to piano, and Ken switched from lead to bass. Jon played any lead or fills on guitar and Paul played drums. Once again, I am singing lead with Ken singing the lower octave of the “Evil Woman” chorus. All the other three doing the backup vocals on the rest of the song. If you listen closely to the intro, you will hear Ken use one of the “Silver Laughter Code” words and then me chuckling in the background.